Your Brother died and left you the family inheritance! That's the message here. 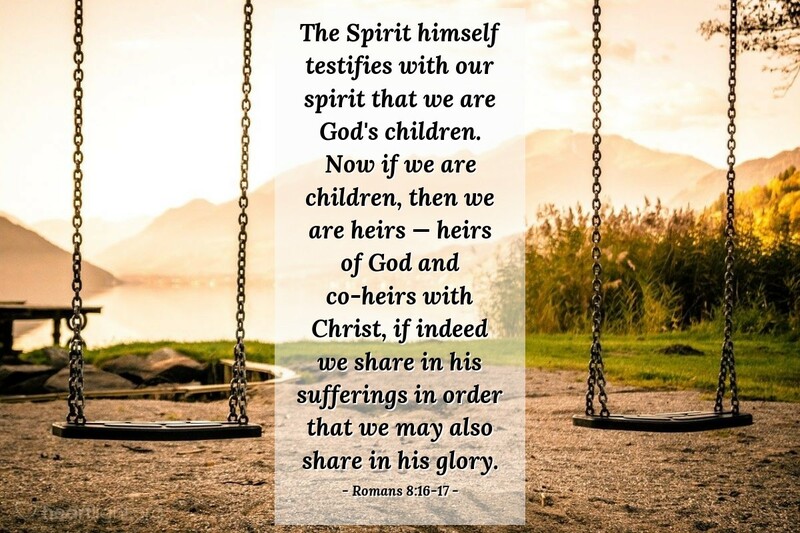 Because we have God's Spirit, we are God's children. If we are God's children, then we are heirs of all that God has to offer us. We are co-heirs with Christ, whose death made our adoption into God's family possible. So if we have to put up with some hard times or some painful difficulties, we will not despair. We know the time is coming when we will inherit all the blessings of heaven! Father, thank you for your grace. I need you to pour out that grace more and more. Please help me bear up under the weight of my trials and temptations with character and faithfulness. Please give me the courage to hang on through the tough times because I know that I will eventually share heaven with you. Thank you for your Spirit, my assurance that I am your child and that I will share in all of your blessings. In Jesus' name I pray. Amen.